In a win against the New York Knicks on January 31, Green tied Hall of Famer Tom Gola's franchise record of nine triple-doubles in a season. Golden State reached the NBA All-Star break at 48–4, the best start to an NBA season at this juncture. 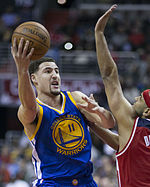 On February 13, Klay Thompson won the Three-Point Contest at the All-Star weekend, beating Stephen Curry 27–23 in the final round. The 27 points tied Curry's record set the previous year for most points scored in a round. By defeating the Atlanta Hawks on February 22, the Warriors became the fastest team to reach 50 wins in a season, accomplishing this in just 55 games. Golden State also had 30 assists in a game for the 29th time this season, setting a new franchise record. On February 27, the Warriors defeated the Oklahoma City Thunder and won their 29th road game of the season, breaking the franchise record of 28 which they set last season. In this game Stephen Curry also broke the single season three-point record (286), a record that he himself held, by making his 287th and 288th three-pointers of the season as two of his 12 three-pointers of the game, tying the single game NBA three-point record (jointly holding it with Kobe Bryant and Donyell Marshall). ^ "With 50-point win over Grizzlies, Warriors set NBA record". NBC Sports. November 3, 2015.